I'm happy to report this film has been picked up for distribution as it's one of our favorite films which premiered out of Edinburgh earlier this year. (review here). I have a screener, and I can tell you this low budget thriller is not only excellent, but original and most likely a launching point for actor Peter Ferdinando who is nothing short of perfect in his role as a loser and serial killer. 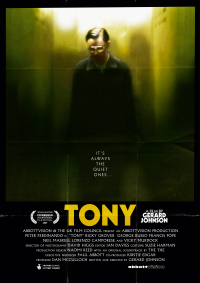 Tony is a loner with an unhealthy obsession for action films, but that doesn't stop him trying to make friends â€“ with, for instance, the drug dealers who hang out near his home, and the ladies who advertise their services in call boxes. Neighbors, TV license inspectors, gay cruisers and junkies are all welcome at Tonyâ€™s flat... as long as they behave themselves. But when a local child goes missing, his odd lifestyle begins to attract attention â€“ and his secrets must surely be exposed. dont even kno who distributes this in theuk...wanna c it reel bad. Sounds exactly like my ex-neighbor. This is screening at Manchester's GrimmUpNorth festival this weekend. Cast and Crew doing a Q&A too. Get yer tickets folks!